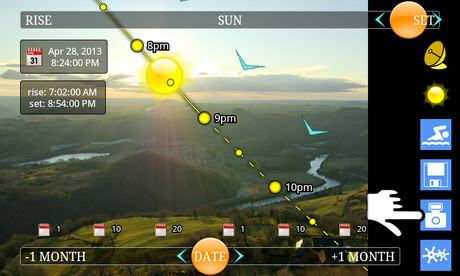 Welcome to SunTrajectory.netLook through your phone and see the path of the sun! 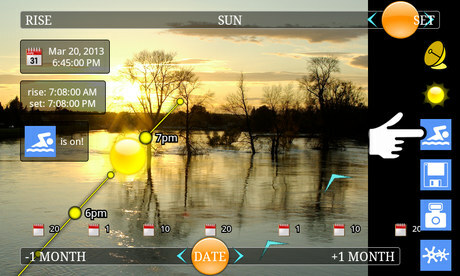 Plan not only the sunrise and sunset times, but also when the sun will be hidden by a building or a relief. Travel in time and see what course the sun will follow in the months to come. Visualize the sunlight in and out of a house you wish to buy for every month of the year. Predict the consequences of a shadow. Think about the orientation of a terrace, imagine creating a new window. Plan your pictures according to the light effect you wish to create. Plan when a subject (like a statue for instance) will be lit from the angle you have chosen. Plan when that same subject will be aligned with the moon. 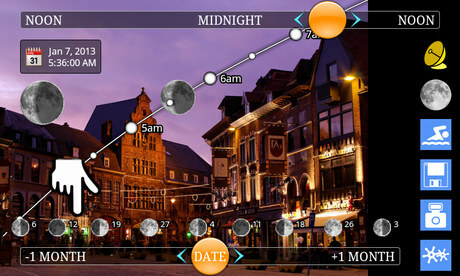 Use the calendar of the moon phases. Plan when the sun will light a scene (and not be hidden by a mountain or a building). Imagine the outline of shadows on the scene at a later date. How to use the app?Each time you start the app, please take a few seconds to turn your phone in all directions: this will greatly improve accuracy! 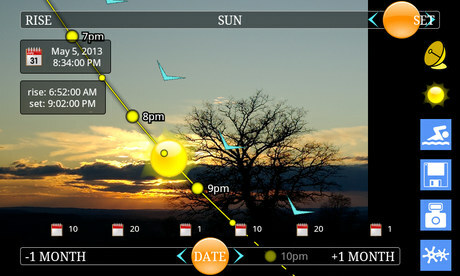 Then simply wait for your phone to find your position on earth (upper icon), since the trajectories depend upon that. Please avoid magnetic fields that may corrupt the compass of your phone: for example, avoid any phone covers with magnets! 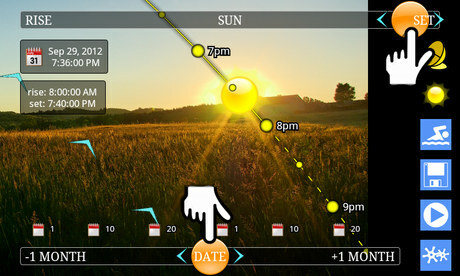 Drag or tap to change the date and thus pre-visualize the sun or moon trajectory in the weeks or months to come. 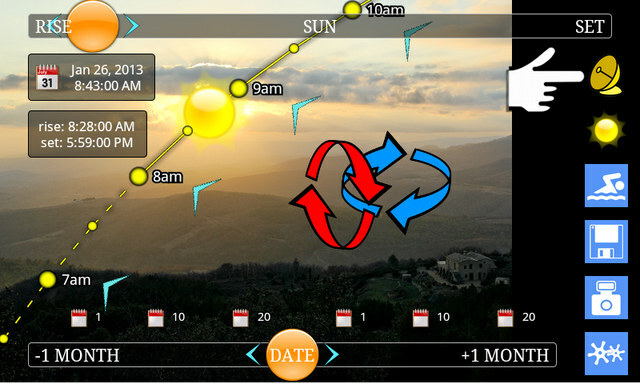 Drag or tap to change the time and make the sun run along its path on the selected day. 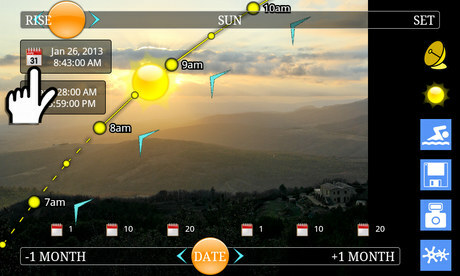 Sunrise and sunset times for the selected day are also displayed. You can also set a particular date using the calendar. Use the "now" button to get back quickly to the present date and time settings. Choose between displaying the sun, its shadow, or the moon. The drawing of the shadow can help you predict where your own shadow will be. If you are at the top of a building or a mountain, you will then be able to predict its shadow! 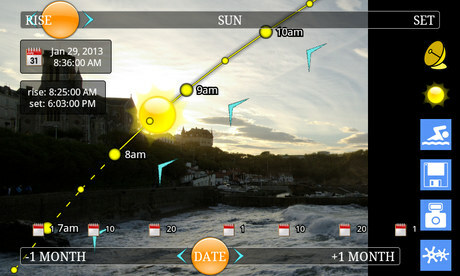 This way, you can immediately see that the sun on this picture will never be lower than the blue arrows. This is also relevant for the drawing of the shadow. 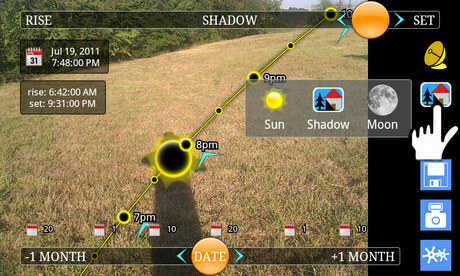 You can then change the date and consult the sun path and the moon path without having to keep the phone steady. Click a second time on the "photo" button to go back to the live video mode. Learn at a glance on which days the moon will be full (or conversely when the night will be moonless). The upper-left drawing shows precisely which phase of the moon you will see on the chosen date. For more details, please visit MoonTrajectory.net. AppsZoom . rated 4* . "Easy, useful and powerful VR app." 100BestAndroidApps . "This really is a special app." "An invaluable tool for scouting and planning photographs." "It's a tool every location manager and scouter should have." "Helps me determine which trees need to be pruned."